I hope you all had a wonderful Holiday spent with family and friends! For this weeks Bloggers Challenge - we are to create anything using the theme Celebration. Celebration encompasses a wide variety of images - so I can't wait to see what the other players decided to create this week. 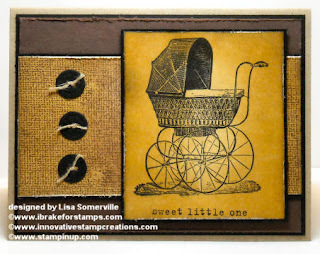 I've chosen to create a Baby card, not your typical baby card, I was going for more of the antique look, to match the beautiful Baby Buggy from I Brake for Stamps. I used the Burnt Edges Technique on Vanilla Card stock, then stamped my Antique Buggy (IBFS), and sentiment from Stampin' Up! in Black Archival Ink. I layered this on my Black panel. I stamped the Canvas Background (ISC) on the other Burnt Edges panel in Chocolate Chip Ink, layering onto my Black Panel. I layered these images onto my Chocolate and Black panels, then onto my Kraft base card. I used my Sizzix Button Die-Cut for the button, threaded through my linen thread then attached to my card as shown. This is beautiful. I love you colors plus the idea of celebrating baby. OH! So pretty and vintage! Great celebration idea! This card is so you! Once again, a beautiful creation. Way to go GF! Great look for that image. Fabulous job as always. Hope you have a fabulous New Year Lisa, thanks for all the fun challenges. Although vintage cards really aren't my favorite, this one sure is beautiful!! Beautiful, Lisa! The technique you used is perfect for the vintage look of the image. Very pretty! You really captured the vintage feel! Beautiful card! Love the old timey feel to it. Stunning card! I am hoping to get to this challenge before the weekend is out. After all, I bought new stamps just for this challenge! The colors that you chose to go with that image definitely give it a vintage look! Super cute! Happy New Year! This is lovely Lisa and does have a nice antique feel about it. Gorgeous, gorgeous card. Love everything about it. Very vintage baby...love it! Great job with the challenge.